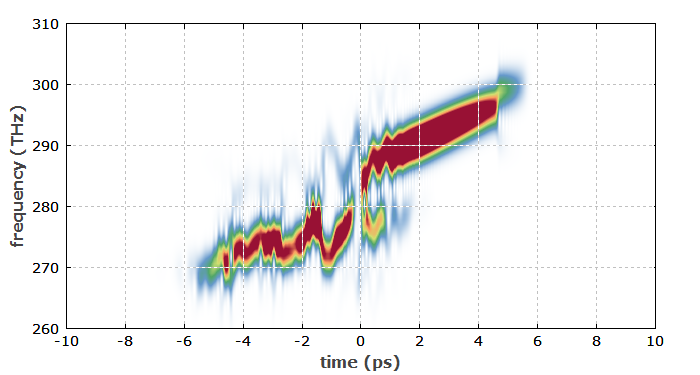 Here, we simulate the propagation of an ultrashort pulse in a fiber amplifier, where the substantial fiber nonlinearity leads to stimulated Raman scattering (SRS). The model is similar to that for parabolic pulse propagation, except that the fiber is longer and the pulse parameters are different. Figure 1 shows the amplified pulse in the time domain. Particularly in the leading part, it exhibits fast wiggles. These result from the interference of the original part of the pulse spectrum with the Raman-shifted part. Figure 1: Amplified pulse in the time domain. Figure 2 shows the pulse spectrum. 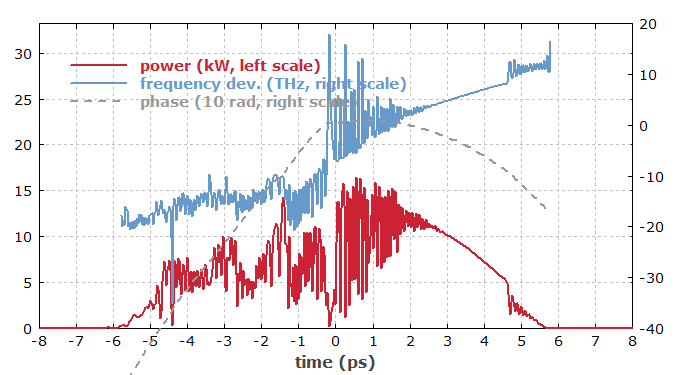 (For comparison, the narrow spectrum of the input pulse at 1040 nm is shown with a dotted curve, with the energy increased by a factor of 30.) Much of the pulse energy has been shifted to the long-wavelength region around 1080–1120 nm. Note that subsequent simulation runs deliver somewhat different structures in that part due to the randomness of Raman scattering, which is influence by quantum fluctuations. Figure 2: Amplified pulse in the spectral domain. Figure 3 shows the spectrogram of the output pulse. The original component shows an up-chirp due to the normal chromatic dispersion of the fiber, whereas the Raman-shifted part exhibits an irregular structure. Figure 3: Spectrogram of the amplified pulse. 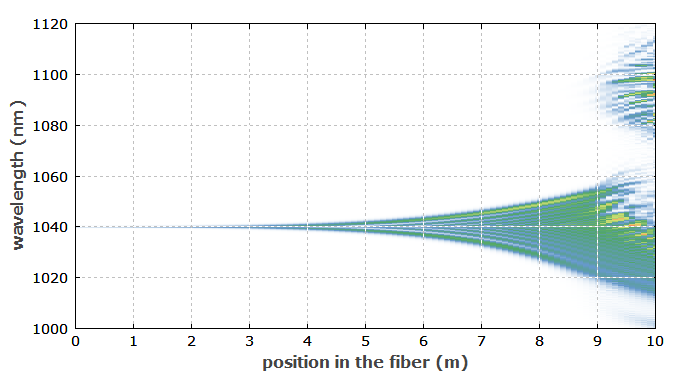 Figure 4: Evolution of the pulse spectrum in the fiber. Note that the detailed behavior of the pulses depends substantially on various parameters. 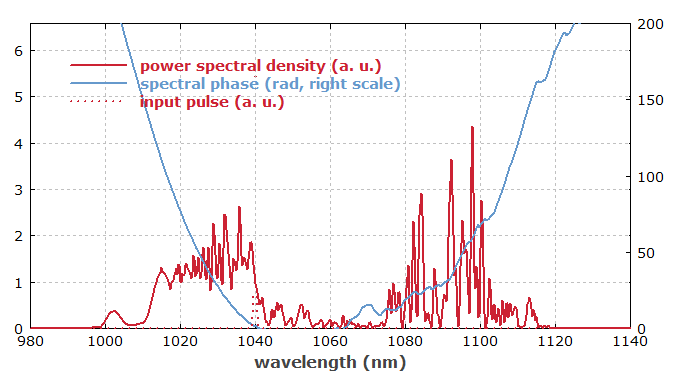 For example, for femtosecond pulses, having a broader spectrum, Raman spectrum can occur within the spectrum. This strongly reduces the impact of quantum fluctuations; the pulse propagation becomes much more deterministic. In other cases, the chromatic dispersion is different, which can also substantially change the results.